The 15-CA32D SONY Super HAD high resolution camera provides an excellent picture in all conditions including very low light and is ideal for use where a high level of detail is required day or night. The 15-CA35D Super HAD high resolution camera provides an excellent picture in all conditions including very low light and is ideal for use where a high level of detail is required day or night. The 15-CE22 is a high quality medium resolution monochrome camera with outstanding picture quality, with an superb range of features, representing excellent value for money. The 15-CE25 is a high quality medium resolution colour camera with outstanding picture quality, with an superb range of features, representing excellent value for money. The 15-CE32 is a high quality high resolution monochrome camera with outstanding picture quality, with an superb range of features, representing excellent value for money. The 15-CE33 is a high quality high resolution monochrome camera with outstanding picture quality, with an superb range of features, representing excellent value for money. The 15-CE35 is a high quality high resolution colour camera with outstanding picture quality, with an superb range of features, representing excellent value for money. The 15-CE36 is a high quality high resolution colour camera with outstanding picture quality, with an superb range of features, representing excellent value for money. The 15-CE26N is a high quality medium resolution infra red sensitive colour camera with outstanding picture quality, with an superb range of features, representing excellent value for money. Infrared sensitive colour cameras will operate as normal colour cameras in normal lighting conditions, and will then act as a monochrome camera in low lighting conditions with infra red lighting. Infra red cameras require infrared lighting to operate in very low light. Infrared sensitive cameras are NOT "switching" day/night cameras but are colour cameras that will use infrared lighting. The 15-CE35N is a high quality high resolution infra red sensitive colour camera with outstanding picture quality, with an superb range of features, representing excellent value for money. The 15-CE36N is a high quality high resolution infra red sensitive colour camera with outstanding picture quality, with an superb range of features, representing excellent value for money. The 15-CB22 is a low cost medium resolution monochrome camera with a good picture quality, with a good range of features, representing excellent value for money. The 15-CB24 is a low cost medium resolution colour camera with a very good picture quality, with a good range of features, representing excellent value for money. The 15-CM20 is a high quality medium resolution monochrome camera fitted in a water proof finger housing. The 15-CM25 is a high quality medium resolution Colour camera fitted in a water proof finger housing. The 15-CM25CM is a high quality medium resolution Colour CMOS camera fitted in a water proof finger housing. This camera is not for use with switchers, quads or multiplexers. The 15-CD16 is a high quality medium resolution monochrome CCD camera board fitted in to a flush mount dome housing designed to be fitted in to false ceilings and is fitted with a 3.6mm lens. The 15-CD25 is a high quality medium resolution colour CCD camera board fitted in to a mini dome housing and is fitted with a 3.6mm lens. Monochrome high resolution dome camera, 12v, 600TVL, 1/3" CCD 3.6mm fixed iris lens. The 15-CD21H is a high resolution monochrome CCD camera board fitted in to a mini dome housing and is fitted with a 3.6mm lens. Colour DSP high resolution dome camera, 12v, 480TVL, 1/3" CCD 3.6mm fixed iris lens. The 15-CD35H is a high resolution colour CCD camera board fitted in to a mini dome housing and is fitted with a 3.6mm lens. Colour DSP high resolution dome camera, 12v, 480TVL, 1/3" CCD 3-6mm auto iris varifocal lens. The 15-CD40VA SONY Super HAD high resolution dome camera is supplied with a auto iris 3.5 to 8mm varifocal lens and provides an excellent picture in all conditions including very low light and is ideal for use where a high level of detail is required day or night. 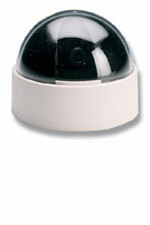 Monochrome high resolution dome camera, 12v, 600TVL, 1/3" Sony CCD, autoiris 3-6mm varifocal lens. The 15-CD45VA Super HAD high resolution dome camera is fitted with an auto iris 3.5 to 8mm varifocal lens and provides an excellent picture in all conditions including very low light and is ideal for use where a high level of detail is required day or night. The 15-CC20 is a high quality medium resolution monochrome camera fitted in a small aluminum housing with audio the camera is supplied with a 3.6mm lens. The 15-CC90 is a high quality medium resolution colour camera fitted in a small aluminum housing with audio, the camera is supplied with a 3.6mm lens that can be changed for either a fixed focus option lens or a manual iris CS type lens. The 15-CJ31 is a high quality medium resolution monochrome camera fitted in a miniature plastic housing with audio and Infra-red LED's with a range of 3 meters. 6 x infra red LED with 3 meter range. The 15-CJ25 is a high quality medium resolution colour camera fitted in a miniature plastic housing with audio. The 15-CG30 is a high quality medium resolution monochrome camera fitted in a ultra miniature metal housing. The 15-B001 is a Medium sized brackets for fixing cameras internally. The 15-B002 is a large sized brackets for fixing cameras internally.